My my, what a day today! 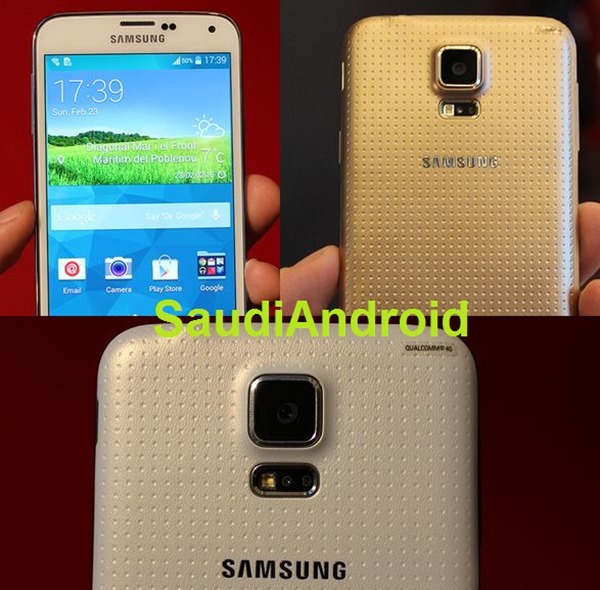 Just hours before the official unveiling of the Galaxy S5 at MWC, we finally have live images leaked for the upcoming Android flagship from the Korean smartphone and consumer electronics manufacturer, Samsung. And boy, do these images have a story to tell! The first and foremost that stands out for the soon-to-be-released device is that the build is plastic, with a patterned back cover. 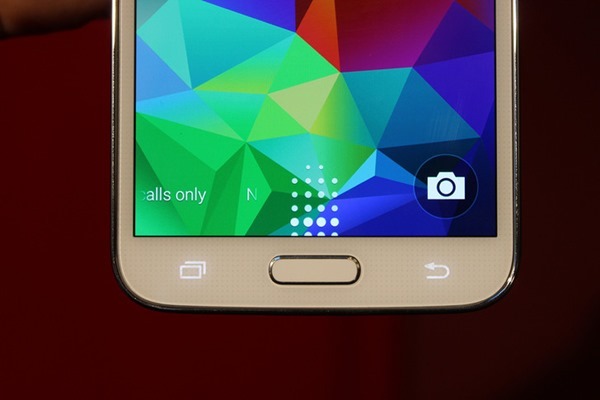 Somewhat disappointingly, it doesn’t carry the faux leather finish of the Note 3, but instead goes for a dotted back cover that should hopefully make the device less prone to being a fingerprint magnet. 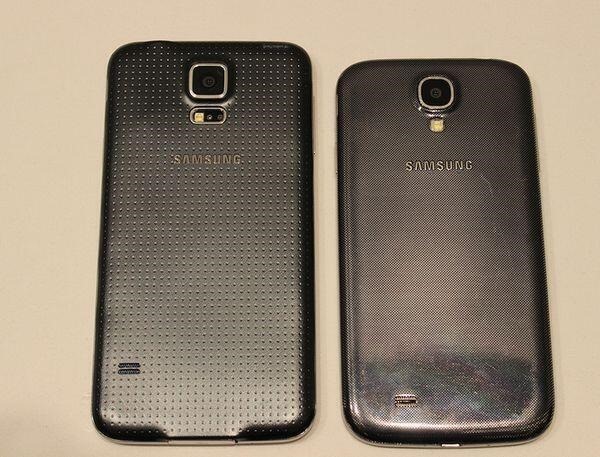 The screen size, although not entirely evident from the leaked shots, suggests a size larger than the Galaxy S4 and smaller than Note 3, so we might be looking at something in the neighborhood of 5.25” diagonally. 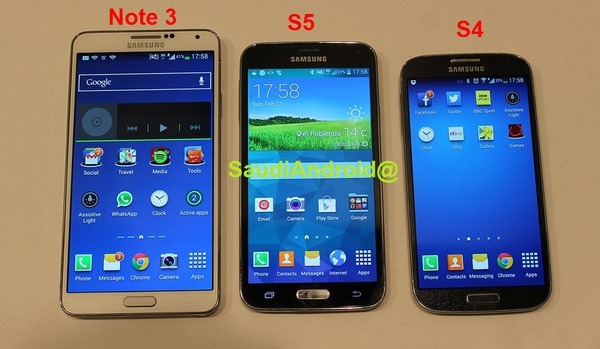 Design wise, it doesn’t deviate a lot from the Note 3, and if truth be told, resembles a smaller version of the phablet. Now for the goodies. 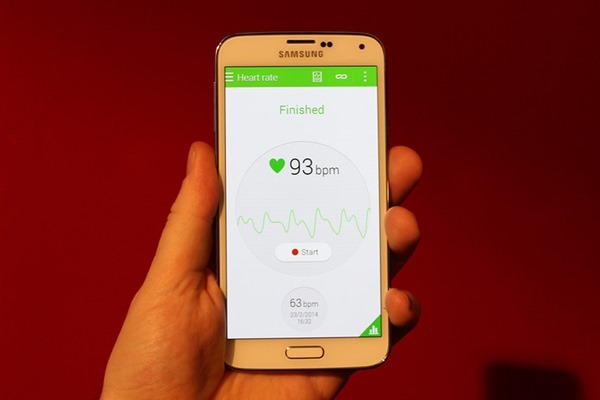 The device does a carry a fingerprint sensor, embedded in the physical Home button, much like Apple’s offering on the iPhone 5s. 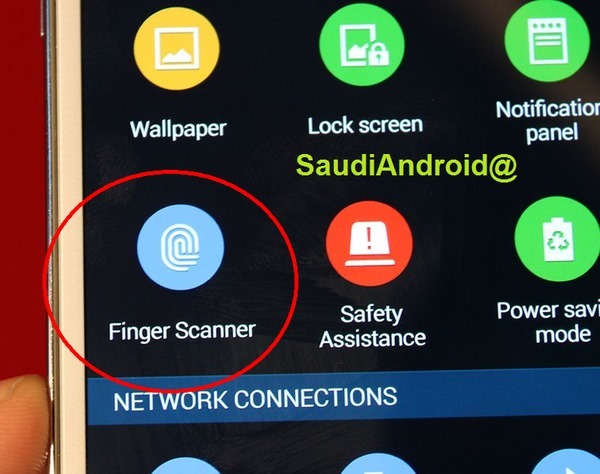 However, this is where the similarity ends, because unlike the fruit company’s implementation, Galaxy S5’s fingerprint reader requires you to swipe your finger over the sensor instead of reading the biometric impression as you place your finger on the button. Not entirely inconvenient, but not the best approach either. 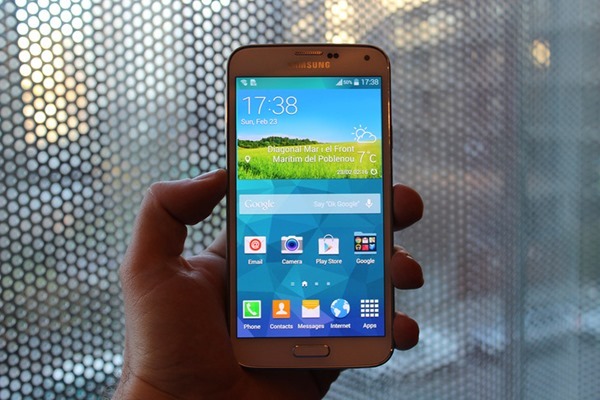 Galaxy S5 is also water and dust resistant, carrying and IP67 standard certification, which means it can tolerate a submersion of up to 1 meter for 30 minutes without breaking a sweat. 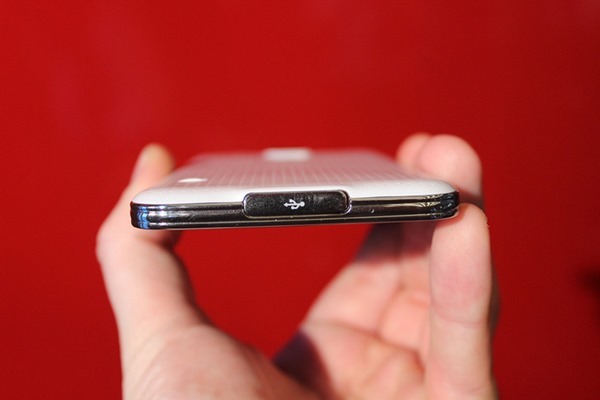 The microUSB port has also been bumped up to USB 3.0, and is covered by a flap for splash protection. 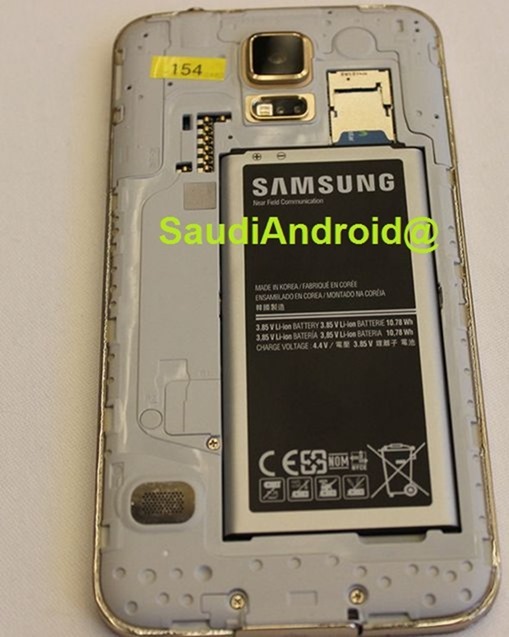 There’s a heart rate sensor on board as well, right below the LED flash on the backside of the device. Finally, there’s the 16MP camera on board for all those wonderful snaps that you’d want to take and show off to the world. The camera will feature ‘selective’ focus, which means you can take a snap and later decide whether you want to focus the foreground, the background or both. The images that you capture will be presented on an HD 1080p screen, although we might a different variant with higher resolution being unveiled today. The new flagship is powered by a 2,800 mAh batter, which might be somewhat disappointing, but that’s what the leaked live images tell us. It’s impressive how Samsung managed to keep a lid on the leaks until now, where the unveiling is just a mere few hours away, especially in this day and age. Nevertheless, we’re looking at a powerhouse that will satiate your inner geek well, and we urge you to stay tuned to Redmond Pie for more details and leaks, as we’ll be covering MWC live from Barcelona!